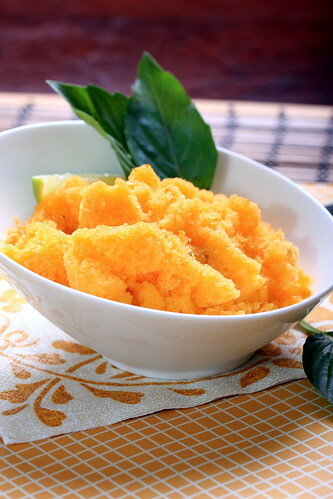 The last time I was in Chinatown, I spotted a huge mound of glossy clementines and picked up several of them which I used to make this crumbly, airy, tart, and not-to-sweet sorbet. The addition of lime here gives it a little extra zing while the basil helps balance everything out. This dessert is simple, vibrant, amazingly light and perfectly refreshing. The day before making the sorbet, place the ice cream bowl component of an ice cream maker into the freezer to chill. To make the sorbet, place all of the syrup ingredients into a small saucepan. Simmer over low heat for about 5 minutes. Transfer to a blender and puree. Add in the clementines, lime and 1 cup of water. 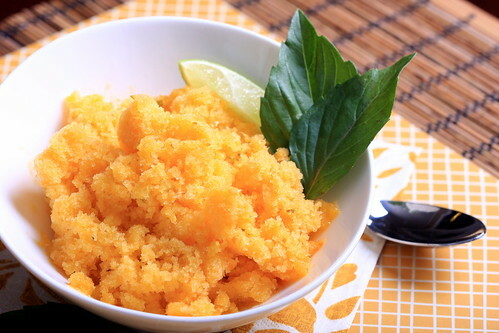 Puree again, then place in the refrigerator to chill completely. Pour the entire mixture into the chilled ice cream bowl component and process according to the manufacturer’s instructions. Serve immediately and store any leftovers in the freezer. Thanks again for your ice cream tips, Caitlin! Freezing the bowl well in advance wrapped in a bag was definitely key to getting this to work. I did try the taro root/coconut as I mentioned earlier and it was very nice until I added some blackstrap molasses which turned it into an ugly color and made the taste very muddy! I regretted it as soon as it hit the taro/coconut mixture. So I just decided to do something super-light instead and saw the clementines and BOOM came up with this. sigh. this is the most perfect palate cleanser, as well as something i could dig into during the last few warm days. it makes me nostalgic for summer already. Thanks Lan! I wish I had made this earlier during the summertime — it really does hit the spot!